This year’s Wavescape Festival boasts a bumper line-up of film and art events, with a record 20 feature and 11 short films at four venues around Cape Town, from Clifton to Masiphumelele, as well as Art Board exhibition and charity auction and Slide Night, where some of South Africa’s top watermen, scientists and activists will speak for 10 minutes each about their experiences with the ocean and show film or photos to illustrate talk. Brett Murray has stepped out from his ordeal in the wake of the Zuma spear incident to decorate one of 10 specially shaped surfboards for Art Board 2012, one of the events in this year’s Wavescape Festival. The Missing Link surfboard, based on a shape by the father of surfing in the Cape, John Whitmore, comes from a time between the long and short board eras when surfing was moving from the old to the new. 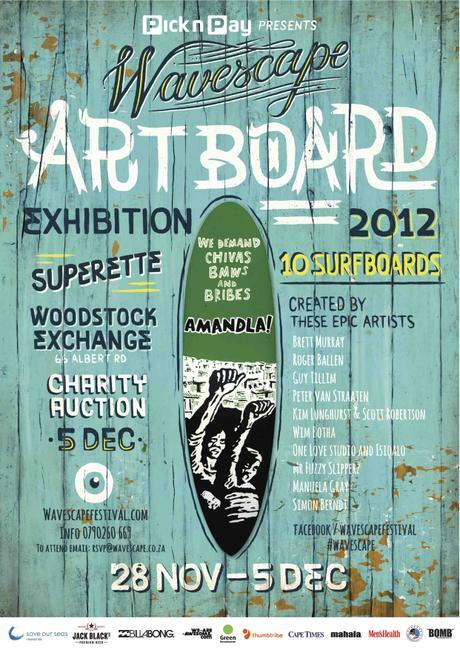 The boards are on show at Superette from 29 November to Wednesday 5 December, when the charity auction takes place. Proceeds from the auction will go to the NSRI, Shark Spotters and the Isiqalo Foundation’s Waves for Change programme. On at Superette at the Woodstock Exchange, Slide-Night is where you get to mingle with some of South Africa’s top watermen, scientists and activists. The evening adds an entertaining but educational touch to our interaction with the ocean as 10 prominent ocean figures speak for 10 minutes each about their experiences with the ocean. Each speaker will show film or photos to illustrate their talk. 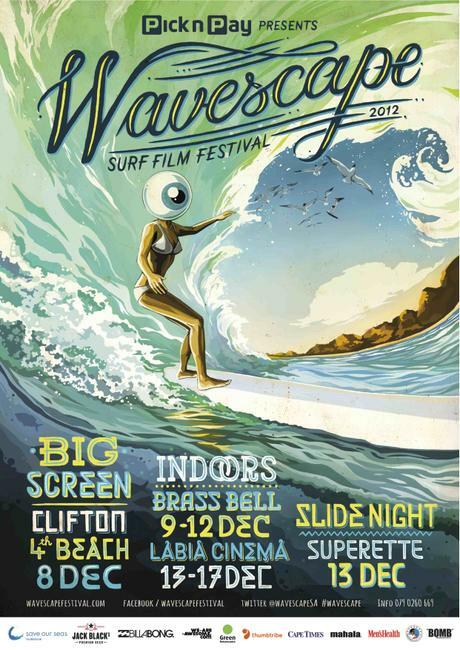 The Wavescape Film Festival, presented by Pick n Pay, with support from Billabong, Save Our Seas Foundation and Jack Black, kicks off for on night on 29 November with an outreach screening in Masiphumelele township near Kommetjie, then from 8 to 17 December at Clifton (free open air screening), the Brass Bell in Kalk Bay and the Labia in Cape Town.